It’s Christmas Eve and here I sit at the dining table in the dark admiring the glow from the Christmas tree while half-watching “A Diva’s Christmas Carol” playing on the Lifetime channel and wondering what to write. 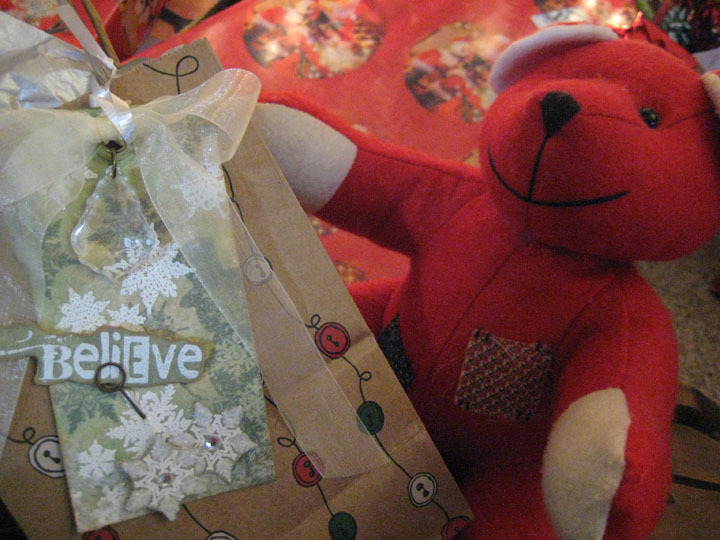 Then I spot the “Believe” tag hanging from the gift bag of cookies and candies and it reminds me that it’s good to believe. It’s good to believe in something. It what keeps us going, keep us positive. I’ve always believed “it” will get better – whatever “it” may be. I believe that as long as Dennis and I have our health and love for each other we’re doing very good. I believe I’m so fortunate to have three healthy children and two rambunctious grand-dogs. I believe we need to do what makes us happy no matter what others may think. I believe we need to take stock of our lives, slow down and kick back every now and then. I believe we need to focus on the good in our lives and let the bad stuff go. I believe in the spirit of Christmas and the good in people. Beautiful thoughts, Linda. I hope you and Dennis have a happy and healthful New Year. I will be on my way to Florida in a couple of weeks. Hi Carolina, Sorry I missed you gals before Christmas but I was called to work! Have a very safe trip and we’ll catch up when you get back. Happy New Year! That was beautiful! I couldn’t have said it better myself. Thank you all for the lovely comments and for being my friends! Love you all and please have a very Merry Christmas and safe travels! You said it sister! May the peace and blessings come to you and your family today and the whole year through. Yes Believe is a very beautful and powerfull word . Wishing you and Dennis and the kids and the grand dogs a very Merry Christmas.